The Pokucka pottery collection, which embraces 360 exhibits is a very thought-provoking collection in the Historical Museum in Sanok. It was given to the museum by Aleksander Rybicki in 1979 and 1980. A. Rybicki was a collector and a great art lover. 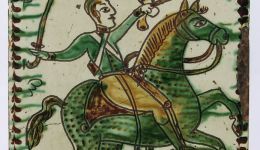 Thanks to him our museum has a possibility to show the greatest collection of Pokucka pottery in Poland, the one which shows a variety of artistic forms and specific local colour of Pokucie region. Pokucie region is located in Eastern Carpathians on the territory of the present day Ukraine. The people of Pokucie, Huculi, were interested in herding, agriculture and handicraft. 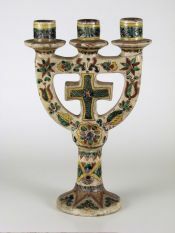 They created original, unique and technologically hard to make half-majolica. Easy fusible and irony clay was used to produced it. Half-majolica was submitted to many processes like “pickling”(“kiszenie”) or “maturing” (“leżakowanie”), what was really labour-intensive. Also the technique was arduous, as from scheduled form producing on pottery wheel to ornamentation – ritting the ornaments, painting, drying, and at least kilning and painting again by pottery paints. The basic colours were: green, black, ocher and yellow, brick-red, dark brown and blue. Floral, geometrical, zoomorphic and anthropomorphic ornaments were made by means of these colours. So we find here garlands, flowers, leaves, triangles and sharp-ended posts, but also birds and deers in front of the forest. Moreover, soldiers and hunters are frequently encountered theme as well as architecture, churches or figurines of saints. The forms of Pokucka pottery were also varied – from simple, ordinary forms to peculiar and subtle ones, more than once refer to ancient patterns. Among them mainly one can find vases, jugs with squats, rounded or bulbous forms, but also the same with longitudinal shapes. Plates, plateaus, jugs and cups representing Kołomyja school, and refering to Greek and Tirol art, attract viewer’s attention as well. Worth mentioning are also products with the most sophisticated forms, original and impressive. There are candlesticks, clay figurines and many household articles. Artistic tapestry and also Huculski furniture completed with tiny wooden products (caskets, plates, decanters) belong to the separate group. Wooden products are ornamented by sculptured relief with floral motives or geometrical one. It is a variety due to inlay and decoration of coral beads. 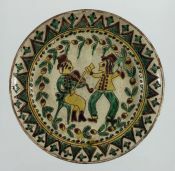 The pottery in question was the product of craftsmen – the artists who usually from generation to generation donated their skills and abilities. Kuty, Pistyń, Kosów and Kołomyja – are the main centre of pottery production. There were also the most important pottery workshops, where all families or individual craftsmen worked. Aleksander Bachmiński is regarded as the formal creator of Pokucki style. Tomasz and Petronela Napp, who worked in Kuty, and the Sowicki family from Kołomyja were famous from a good technical workshop. At the turn of the 19th and 20th century the main centre of the artistic pottery was Pistyń. Among many potters who worked there, a special place had the Koszak family. Piotr Koszak after having won many a prize, modernized his workshop, which allowed him for a growing production and gave a possibility to bring his technique to perfection. His wife, Emilia Koszak, was of great help in this strenuous work. After a while she became familiar with the pottery profession and was famous for perfect drawings with Baroque features. 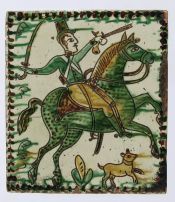 During the interwar period Jan Broszkiewicz specialized in pottery. He is regarded as an unconventional master, whose creation – professional and extraordinary – was closer to town recipients than his own milieu. In the collection of the Historical Museum there are also some vessels from the last period of the creation of the artist – the potter from Pokucie, like metal amphora ornamented by highlander’s motives called “parzenica”. We can also see the Napp family’s vessels – jugs and amphoras which refer to Greek and Persian patterns. The pottery created by Piotr Cwiłyk is soaked with the high artistic level and rich ornamentation. Moreover, it refers to ancient patterns. 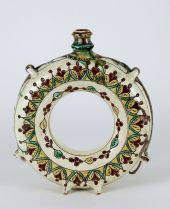 Undoubtedly the most valuable object of Pokucka half-majolica is a tile stove made in 1849-1851 by Aleksander Bachmiński, which belonged to the family of Xawery Dunikowski. When the sculptor died, Aleksander Rybicki obtained and brought to Sanok this pottery object, which, after cleaning, turned into one of the best Bachmiński’s work. On its tiles there are sacral, floral, geometrical motives and also scenes from everyday life. Aleksander Rybicki’s collection is complemented by the gifts from other famous collectors, for example Jadwiga Zalewska from Sanok.